Whose place explores people’s changing experience of the urban environment, mediated through its constantly transforming surfaces. It takes us from a tight tribe in near-pristine forest to the inhabitants of a dense metropolis attempting to navigate complex social relations. 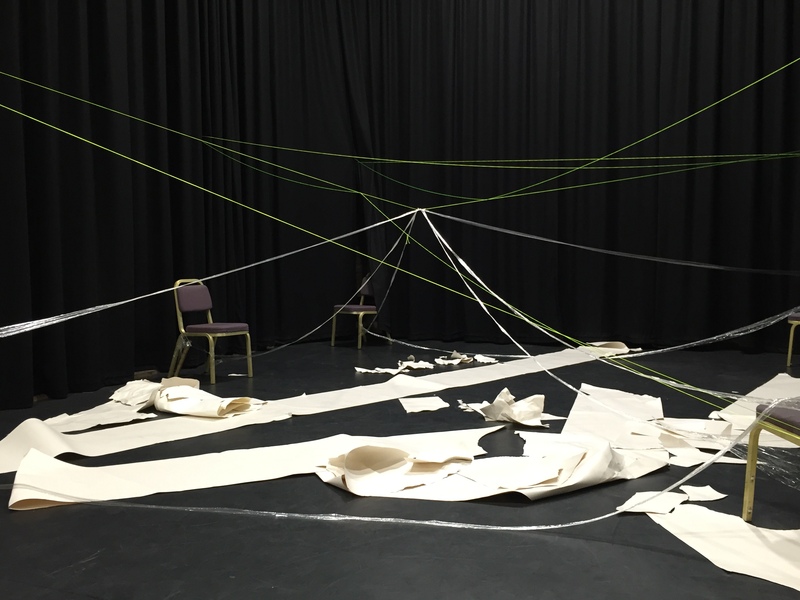 Following an extensive development process, which included a week here at Arts Centre Washington, we are presenting two performances at Space Six in Commercial Union House, Newcastle on 27th April (7 pm) and 28th April (2 pm). Whose place Is visually exciting, as the story unfolds on a constantly changing set. It is surreal, beautiful and destructive. It tells the story through a fusion of text, original music, video and live performance. It is an entertaining, playful, fast-moving, play, full of humour, and is suitable for anyone who’s seen their own place change and is curious about how it happens. Whose Place runs for 90 minutes and has a cast of six. It is designed for a studio space and has minimal tech requirements. We are eager to start conversations around programming Whose Place? in studio spaces from Autumn 2018 onwards. Intensive Research and Development weeks at Arts Centre Washington and The Studio, High Spen were integral to the development of Whose Place? Some images from these development weeks can be seen below.